This was what Holly did like about cooking. The do-over aspect. There were no do-overs in love, in relationships, unless the It’s Not You, It’s Me was willing. But risotto, overcooking pasta, underseasoned sauce– there were not only second chances but hundreds. The Love Goddess’ Cooking School details what happens when a few people introduce a melange of dissatisfaction, fear, sadness, despair, wants, dreams and varied experiences in hopes of changing their life course through the art of cooking Italian food. Gifted author Melissa Senate utilizes her deft ability to create both likable and unlikable characters who mix and mingle throughout the novel. The main character, Holly Maguire, has left behind a love in San Francisco and decides to try her hand at taking over her recently deceased grandmother’s homemade pasta and sauces boutique as well as cooking class. While learning how to cook and teach, Holly in turn discovers much about her own strengths and needs. She also watches and guides other members of her class toward new paths which will make them more content. 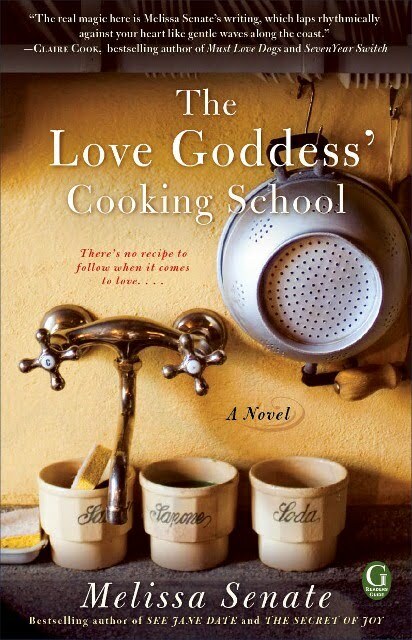 The Love Goddess’ Cooking School takes the reader on a charming, abundant journey. 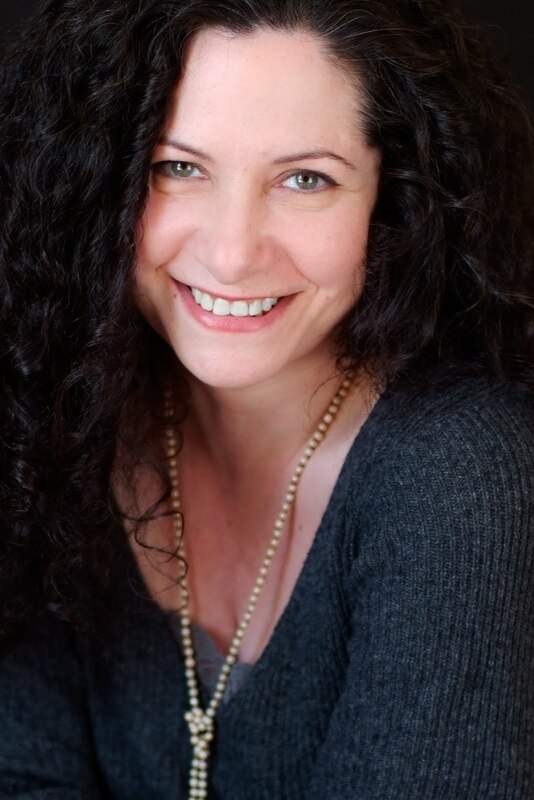 Aimee Steele [AS]: I interviewed you almost exactly a year ago for The Secret of Joy. Pretty Cool. Melissa Senate [MS]: And I appreciate your interest in my work! AS: How did you come up with the idea for The Love Goddess’ Cooking School? MS: A combination of my thinking about my late grandmother, who would only talk about her interesting life (Orthodox Jewish upbringing on Manhattan’s Lower East Side, her three siblings who never married, her two husbands . . . ) in the kitchen. While cooking beside her, scrubbing potatoes or forming meatballs, I got quite the earful. Also, my young son loves to cook with me, and on his sixth birthday, he made a wish: “Please let mommy say yes to getting me a mouse, rat or hamster for my birthday. Please, please, please with extra please on top” into the eggs he was stirring. The combination of food and cooking bringing people together, of wishing and asking and remembering while cooking, melded together to inspire the book. AS: A lot of people romanticize Italy and Italian food. What do you think the attraction is and why did you decide to have it be the focus for The Love Goddess’ Cooking School? MS: I went to Italy on my honeymoon and it’s everything it’s romanticized to be (even though I’m now divorced!). The food is everything from comforting to decadent, from solid to romantic, from plain to magical. Italy is so rich with history and beauty and architecture and religion and wine and, yes, the amazing food. AS: In general food and romance go together so often. Do you have any theory on that? MS: I think it has something to do with the age-old dinner date or sweet picnic or mom or grandma (if they’re the sweet kind) making your favorite meal and baking you cookies. Food means comfort and satisfaction. AS: You told me recently (via twitter) that you like “to examine the perception of feeling alone especially when cut off from family.” Why? MS: I like to explore some real stuff from my own life, family estrangements, oddities, the usual family dysfunction in my fiction. It’s interesting to me to watch how a character seeks connection, love, family, friendship from others, whether new friends or lovers, when she feels adrift or alone or cut off from her own family. There’s a longing there I love to explore in my work. AS: What is the importance of including the Grandmother’s diary entries in the book and for Holly? MS: Originally I gave Holly’s grandmother her own point of view, but her voice seemed too dominant and her story too big, so I decided to encapsulate her world in the diary entries. I wanted to parallel what Holly was doing with what her grandmother was doing—teaching the cooking class for the first time. I loved researching the early 60s culture for Camilla Constantina’s diary. AS: In The Secret of Joy there was a box of unsent letters and now you have a diary that’s left to be read. What is your fascination with letters, diaries, writing longhand about thoughts etc.? MS: I do love the discovery of letters, written in longhand with the writer’s imprint and its effect on the finder. A treasure trove of history, explanation—yet that’s all: you can’t ask questions of the writer. You can only interpret. And that interpretation can often lead to discoveries about yourself. MS: I’m slightly superstitious and I do love to believe in all that. A $5.00 palm reader on a New Orleans street corner told me 15 years ago that whatever I was doing, I was on the wrong side, ie if I were an actress, I should be a director. If I were a teacher, I should be a student. I said: “I’m a book editor, but I can’t be a writer, so forget that.” A few years later, I wrote my first novel. I think it’s luck, being in the right place at the right time, both literally and figuratively, and trying. Trying is everything. AS: What do you appreciate most about Maine and what do you want people to take away about the state from this novel? MS: I moved here six years ago from a city of 8 million to a town of 8,000. I appreciate the quiet more than anything. It’s SO quiet. There are trees and water everywhere you look. I like to set books here now because Maine is such a comfort in itself; there’s no pressure here. Seriously you’ll never even hear a car horn honk. It’s everything it’s said to be. I also like the rugged beauty of Maine; there are some tourist spots and fancy hubs, but for the most part, Maine is all rugged coastline and moose and fleece and land. AS: Often grandchildren never get to really know their grandparents that intimately. You really created a lovely relationship between Holly and Camilla. What drew you to focus on that relationship? MS: I wanted to pay homage to my late grandmother, who I mentioned above. There’s so much to learn from your grandmother—about the history of family, the stretch of generations, the way the past affects the present. Plus, my grandmother made me feel very special at a time when I was very confused as a kid over family angst. I wanted to give Holly a special grandmother, especially because Holly couldn’t connect with her mother while growing up and as an adult. AS: Why did Holly’s mother steer clear of Maine and her mother’s cooking ventures? MS: Holly’s mother had been there, beside Camilla Constantina, the first time Camilla had been branded a “witch” and thrown out of the snooty, influential islander’s house. Holly’s mother grew up hating Camilla’s fortune telling, her exotic looks, her “magical” cooking. And so she moved away the moment she could, settled with a conventional man, and never could connect with Holly, who loved the lore surrounding her grandmother, loved the island and loved cooking beside her grandmother. AS: I did like that Luciana told Holly that she believed that no one should be talked into a life. Can you explain that concept a bit more? MS: I think people get talked into a life all the time, whether by someone else or themselves. It’s so easy to be steamrolled by someone else, be pulled by someone’s else’s vision, and it’s easy to rationalize. At some point, you know when you’ve made a wrong move or when something doesn’t feel right simply because it doesn’t. You can honor that or try to fix it and make it right. I’ve done both. Sometimes, though, where you’re kicking and screaming is where you need to be, and the problem is inside you, not where you are. MS: She was in a tough spot with her overbearing mother and moving-on sisters and feeling like she had to do, do, do just to find what anyone wants: partnership, love, connection, your person. AS: Tamara, Juliet, Simon and Mia all join the cooking class for different yet similar reasons. What made you put this group together? How did you create these characters? MS: Mia came full blown into my mind, just one of those wonderful, magical writer moments. When I imagined a group of five standing around a kitchen island, making pasta, I only knew they were all seeking. And the group came to me one by one with their backstories, asking for help. As I thought them up, their stories filled themselves in. AS: What was the most challenging part of writing The Love Goddess’ Cooking School? MS: The cooking. I spent months in the kitchen researching the recipes I wanted to use, making dishes over and over until I got them right and changed this and that enough to make them mine—Camilla Constantina’s. I started out a terrible cook and ended up pretty good at classic Italian cooking. AS: What do you like best about your character Holly? MS: Her seeking soul, I think. She tries hard. And she’s kind. I like kind. AS: Read your dream cast for movie version and so agree w/ Kate Winslet, Robert Downey Jr., Ryan Gosling and Vera Farmiga. Adore them all. MS: I had luck once with a TV movie deal and so the possibility always seems very real now for the small or big screen, even though my chances of it happening again are a zillion to one. You never know is a good motto, though. Thanks for these great questions. So appreciate the careful read and thoughtful questions! This entry was posted on October 26, 2010, 20:55 and is filed under Books, Interview. You can follow any responses to this entry through RSS 2.0. Both comments and pings are currently closed.